Sister Lauren Spence is an artist. An intricate mosaic that hangs just outside of the chapel at Our Lady of Good Counsel in Mankato, Minnesota, shows her skill and eye for color and detail. The mosaic was a project for her M.A. from the University of Notre Dame. An educator for more than 25 years, she taught art, history and Latin and served in Germany and Rome. For the last 14 years, she has served as an artist for the Mother Bear Project. The Mother Bear Project is a non-profit organization based in Minnesota that distributes handmade bears to children affected by HIV/AIDS in the developing world. The bears are meant to provide comfort and hope to children who have nearly nothing. 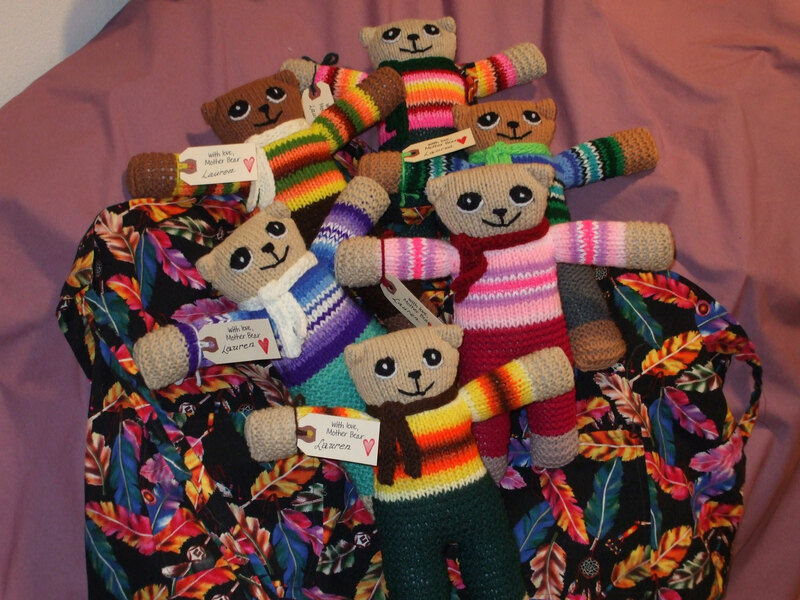 The bears are hand-knit from a common pattern and made by volunteers from all over the world. Sister Lauren had heard about the project and volunteered to make a few bears even though she did not know how to knit. She noted that making the bears was not interesting or engaging, but good to her word, she made a few. She decided to keep going, made a dozen or so bears, and decided that was that. Everything changed when a maintenance worker at Our Lady of Good Counsel came to work on the floors in her room. He asked about the bears, and she told him about the project. He was touched and commented that the bears were going to children who had very little. That exchange ignited Sister Lauren’s passion for making bears. The ministry that started as a couple bears has become a passion, prayer and love for more than 14 years. “It is an honor and privilege just to be asked to serve,” she says, “You just don’t know how people are going to be touched by a ministry.” At age 90, Sister Lauren has slowed down bear making as eye issues have impeded the process, but she is quick to add that some former students have now become involved in the project, carrying on the legacy. Learn more about the Mother Bear Project on their website www.motherbearproject.org. Communities rebuilding after Louisiana flooding On Aug. 12, 2016, flooding damaged many communities throughout Louisiana, including those of School Sisters of Notre Dame associates and sisters’ families. Although several months have passed and life is slowly returning to normal for those affected, rebuilding damaged homes and businesses is ongoing, yet communities have remained prayerful and supportive of one another. Photography and prayer Sister Kathleen Storms has found a way to pray and meditate through her photography. Focusing on nature and the colors of the season, her featured work will be the cover of the Eastern Iowa Regional Telephone Directory. Supporting Fair Trade School Sisters of Notre Dame support and believe in Fair Trade. By following Catholic social teaching principles of respecting the dignity of work and caring for the poor, people can make a profound difference.